15 year old Oliver Tate (Craig Roberts) is completely focused on two things. Firstly he wants to lose his virginity by his next birthday - preferably to red coat wearing classmate Jordana. Secondly, he wants to stop his Mum Jill (Sally Hawkins) from running off with their new-age neighbour (and her ex-boyfriend) Graham Purvis (played by Paddy Considine and featuring the most dreadful hair cut). This is the first film of my challenge that I didn’t like. I am finding this film quite hard to review as I generally lack confidence in my more negative opinions. The thing is, I did appreciate Submarine. I love any film with Sally Hawkins in it and thought that Craig Roberts and Noah Taylor (who plays Lloyd Tate, Oliver’s father) were very good. I also appreciated the way the story was told. I just didn’t like it. Oliver is self-obsessed - he both annoyed and frustrated me. While I recognised his deadpan delivery as comedic, he didn’t make me laugh. The film didn’t make me laugh. I could understand why Oliver’s mother would be tempted to have an affair - her life is very hard - I just didn’t see how she could be attracted to the odious Graham. The only character that I felt any sympathy for was Lloyd Tate. His quiet struggle with depression was quite moving. 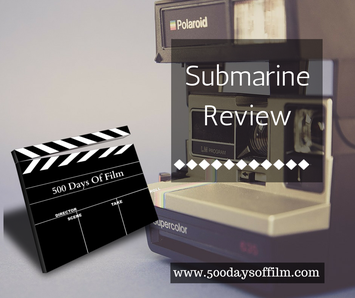 Submarine isn’t a bad film - far from it. It has great style and intelligence. Perhaps I am not getting something that I should be. Perhaps I should watch it again. Perhaps I should just accept that not all films on my list are going to work - for me. Ah, do you remember the polaroid camera? Brilliant!